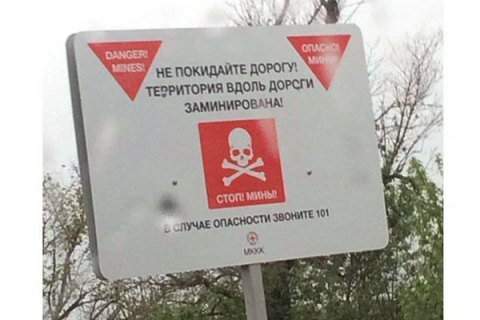 Ukraine is third worst on the land mine contamination of territories. Ukraine ranks world's first in terms of the number of casualties of landmine explosions, Humanitarian Coordinator, UN Resident Coordinator and UNDP Resident Representative in Ukraine Neal Walker told a press conference in Kyiv on Monday, 4 December. "Ukraine ranks third in the world in terms of the territories contaminated with landmines, and is in the first place in terms the number of people who died in the explosion of landmines," he said. In turn, Ukraine's Minister for Temporary Occupied Territories and Internally Displaced Persons, Vadym Chernysh, noted that the clearance of the territory in Luhansk and Donetsk regions from explosive items is extremely complicated because of the continuing shelling. According to the report of the International Movement for the Prohibition of Anti-Personnel Mines (ICBL) for 2015, Ukraine had 589 deaths or injuries as a result of landmine explosions. The Geneva Center for Humanitarian Demining reported that in 2016 43 people were killed and another 58 injured in Ukraine in the explosions of anti-tank mines. Late last month, The Washington Post published the figures of humanitarian demining organization Halo Trust that said 1,796 people became since the beginning of hostilities in Donbas became casualties of landmines in Ukraine, including 238 civilians killed and 491 wounded.